I was asked a question via Twitter the other day that I thought warranted its own blog post. 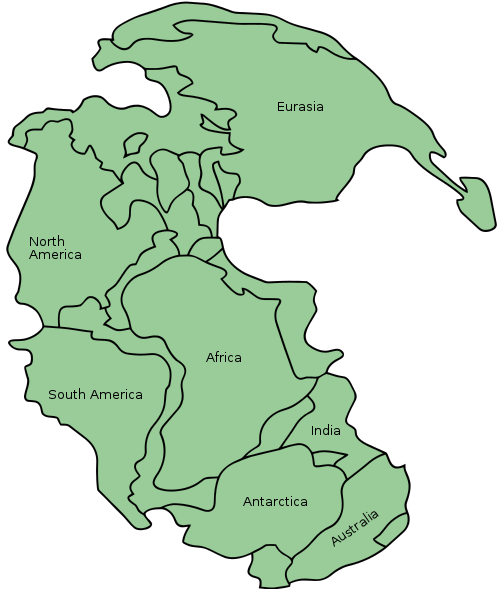 The question was in regard past supercontinents, like Pangaea, which existed during the time of the dinosaurs (forming about 300 million years ago and lasting until about 70 million years ago), and the much-older Rodinia (existing between 1.1 billion and 750 million years ago). At these times (and probably other, even earlier times) all of the Earth’s major continents were combined into one huge continent. Notice on this map that outlines of most of the modern continents can be shown. Such boundaries would not have been so obvious if one were walking around on Pangaea at the time. The Earth’s continents, at least the main cores of them, have existed for billions of years. Near the center of each continent is what we call the craton, which is a solid core of rock that is more than a billion years old. Each craton moves as a coherent unit across the Earth due to plate tectonic activity. These cratons, though smaller and differently shaped in the remote past, can be traced back into Earth’s history. These cratons have collided and split apart again several times since the Earth formed. The question I was asked, however, was not so much about the continents, but on the oceans surrounding and separating the continents. How do we know they were there, and where do they get their names? On maps of Pangaea, today’s continents are often labeled, but not today’s oceans. These are replaced with other, unfamiliar ocean names like Tethys and Panthalassa. Similarly, the ocean surrounding Rodinia was also called the Panthalassic Ocean (though sometimes this is called the Paleo-Pacific Ocean). The Iapetus Ocean (shown below) formed as Rodinia broke apart. Panthalassa is a word derived from Greek that means all ocean. The Panthalassic Ocean completely surrounded all of Pangaea and all of Rodinia, so it’s an apt name. Tethys (and paleo-Tethys on the map above) was a sea that separated two important part of Pangaea: Laurasia and Gondwana. Laurasia was composed of what is now North America, Europe and Asia; Gondwana included the modern continents of South America and Africa. The term Tethys actually refers to several oceans and seas that formed in this general area. The modern Black and Caspian seas may be remnants of one or more of these events. It is for this reason you might see maps labeled as Tethys Ocean, Tethys Sea, and Paleo-Tethys. These are not all the same thing, but there is confusion about which is which, since they were all at about the same position with respect to Laurasia and Gondwana. You can read more about that here. Tethys closed up and vanished when what is now India collided with Asia, resulting in the formation of the Himalayas. The Iapetus Ocean, which formed during the breakup of Rodinia was formed by rifting between much of what is now North America and Africa, much like the modern Atlantic Ocean. It gets its name from the Greek titan of Iapetus, who was the father of Atlas, for whom the Atlantic Ocean was named. Thus Iapetus, the proto-Atlantic, is considered the ‘father’ of the modern Atlantic. It’s not clear from the map above where the Iapetus Ocean ends and the Paleo-Pacific Ocean begins. Most likely, this distinction would be made based upon the furthest extent of the rifting that formed the Iapetus Ocean into the Paleo-Pacific Ocean. This would be hard to get at with the rock record, so this is likely a fuzzy boundary in any reconstructions of continents and oceans from that time period. So how do these seas and oceans relate to the familiar oceans of today (Atlantic, Pacific, Indian, etc.)? Panthalassa is essentially the same ocean basin as the modern Pacific Ocean, which is why it is sometimes called the Paleo-Pacific Ocean. The modern Atlantic Ocean and ancient Iapetus Ocean are related to each other in that they formed from rifting and separating North American (Laurentian) and African cratons from one another. The Iapetus Ocean closed up when Pangaea formed. The Atlantic formed in roughly the same place when Pangaea broke up. Tethys in all its iterations has no modern equivalent. There are only the remnant inland seas (the modern Black and Caspian seas) and the rock record for us to know they were ever even there. How then can we know that oceans like Iapetus and Tethys even existed if they have closed up and disappeared? The answer is in the rocks. There are a couple of ways to approach the problem. One is to look at sedimentary rocks covering the various cratons. Sedimentary rocks are those that form from the breakdown, transport, and re-deposition of materials from older rocks. They tend to include fossils. First, one must get a handle on the age of the rocks. There are several methods available, including radiometric ones. It’s too much to discuss here, but here’s a post describing some of the common dating techniques used in geology. When one looks at fossils collected geographically close to each other that lived at the same time in geologic history, one would expect the species found from locality to locality to be the same. If the species are different, one can guess that there was some large barrier separating the different localities and keeping the organisms from occupying both regions. In the case of Iapetus, rocks from Cambrian and Ordovician age are found in both North America and Europe. If there was no ocean between these continents in the ancient past, one would expect that the fossil species found would be similar. However, the fossils from these rocks, representing two different kinds of common marine animals, trilobites and graptolites, are very, very different, suggesting that when they lived there was a great distance between them. That distance was the Iapetus Ocean that separated them. The rocks themselves also hold some clues to the existence of a former ocean basin. The figure above shows the ‘Iapetus suture.’ A suture is where two continents have been made into one by collision. The result is a great deal of bending, folding, and faulting in the rock, resulting in the rise of a mountain range. Minerals in the rocks are also frequently changed into different minerals due to the intense pressure. These features can be identified and measured by geologists. The mountain range formed when the Iapetus Ocean closed is now largely eroded away. Some remnants that remain include the Appalachian Mountains of the eastern United States. The closing of Tethys is marked by the collision of India with Asia about 70 million years ago (there’s lots of argument about this date. Don’t quote me on it). The mountains formed by that collision are the tallest in the world, the Himalayas, and they’re still growing. There is a third way to get at where the continents were in the Earth’s ancient past. And by knowing where the continents were, it is possible to make some good guesses about where ancient oceans were as well. This method uses paleomagnetism, the preserved remnants of the ancient magnetic field of the Earth. This is described at some length here, but is a little on the technical side. The principle is simple enough. The paleomagnetist (a geologist who studies ancient magnetism on Earth) finds a rock from which he or she can get an estimate of age and that still preserves the ancient magnetic signal. The signal preserved in rocks has two important components, one that tells us which way was north, and another that lets us approximately at which latitude the rock formed. Taking this information, the entire craton from which the rock was collected is moved and rotated on the Earth’s surface so that north on the craton at the time of interest points toward true north and that it’s at the correct ancient latitude. This is done with all the other continents as well. Using geologic information from fossils and rocks, one can tell which cratons were next to each other and which ones were separated by oceans. And thus, you can reconstruct the configuration of oceans and continents into the remote past, and make cool graphics like this. I hope this answers some questions for people. I’m sure it will also bring up other questions. Please feel free to ask them in the comments. This entry was posted in Geology, UREES101 by Penny. Bookmark the permalink. The square outlined by Asia. Africa, and Australia labeled as the Paleo-Tethys Sea… how many miles square is that?